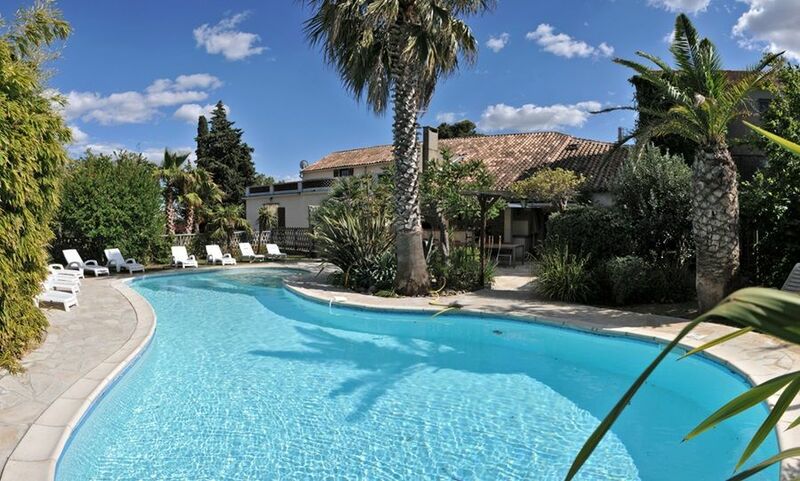 Large character house near the Canal du Midi with swimming pool. In a haven of exotic plants Oasis offers an ideal rental for large families and groups of friends. The swimming pool 12 mx 6 m with a depth of 0,80m to 1m70 is secured by an alarm as well as a barrier. Playground with bowling alley, ping-pong, swing, slide. municipal tennis at 100 m.
Carcassonne, the beaches of Gruissan, Narbonne. We were 15 persons, three generations from 2 to 58 years old and we all had a fantastic two weeks in Argeliers and the Oasis villa. There were things for everyone. Of course, the pool was the center piece during the days, when we didn't do sightseeing all over Aude. For the youngest kids, the play area was super, located in a shadey area where the older could play petanque while watching the children. For breakfast and wonderful long barbeques, the outdoor kitchen and sitting area was perfect. Argeliers itself had a great bakery and winerie's that supported our basic needs, and for food shopping there is a small store in the village and supermarkets conveniently close by car. The bedrooms are spacious, with great beds and with bathroom/shower facilities enough for everybody. "What a fantastic house! The house is beautifully furnished and fully equipped for 16 people to stay comfortably. The garden, pool and outdoor kitchen are superb. The location was perfect, with easy access to a great variety of activities and attractions. Definitely 5 out of 5 for everything." A great holiday home for large families or groups of friends. It has that lovely Southern France holiday feel to it, with its gorgeous outside kitchen and pool surrounded by palm trees. Lots to see and do in the neighbourhood too! "L'Oasis was a fabulous property in very private grounds with secure parking for 3 cars. The outdoor living space was superb with 2 separate dining areas. All bedrooms were clean. Owner extremely cordial. A wonderful property." Habitué à partir en groupe, nous étions 8 adultes et 7 enfants, et nous avons tous passés un très bon séjour, la villa est spacieuse et possède tout ce qu'il faut. Le propriétaire est sympathique et se soucis qu'il ne manque rien. La piscine est grande, il y a des chaises longues pour tout le monde, la cuisine extérieur est très pratique. Une location que je recommande fortement. Merci pour votre séjour dans ma location, ce fût un plaisir de vous accueillir..
La domaine est spacieux, avec une belle piscine et terrasse. La maison est très spacieuse, mais besoin de quelques rénovations. Le propriétaire était très gentil et il venait tout de suite quand nous avions une question. (Text automatically translated) The vineyards and the cellars of the Minervois, the Canal du Midi, the Cathar Castles Carcassonne, beaches Gruissan, Narbonne. African Reserve Sigean.